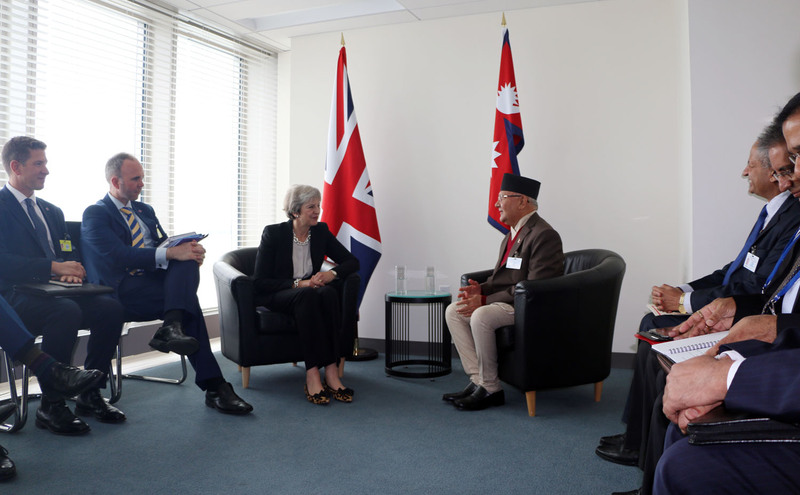 New York (27 September 2018) – Prime Minister KP Sharma Oli has held bilateral meeting with British Prime Minister Theresa May at the UN Headquarters today at the sideline of the 73rd United Nations General Assembly (UNGA). Currently, both the Prime Ministers are in New York to attend the 73rd UNGA. During the meeting, the Prime Ministers recalled the centuries-old Nepal-UK friendship and bilateral relationships, Charge d’Affaires of the Permanent Mission of Nepal to the United Nations, Nirmal Raj Kafle said. Likewise, issues relating to trade, investment, tourism and cooperation in multiple sectors were also discussed, Kafle added. Minister for Foreign Affairs Pradeep Kumar Gyawali; the Prime Minister’s Chief Advisor Bishnu Rimal; Nepal’s Ambassador to the United States of America Arjun Kumar Karki; Charge d’ Affaires of the Permanent Mission of Nepal to the United Nations Kafle; Foreign Secretary Shanker Das Bairagi; and Government of Nepal other senior officials were also present on the occasion.